Nearly 50 participants representing about 20 Universities and Institutes across the country attended the three-day meeting. TMT-India and TMT-Japan teams also joined in the discussion of HROS remotely. Representatives of TMT-China project, science and technology teams reported their progresses with topics including: management (NAOC), science (TMT SAC member), M1 segments (NIAOT), M3 system (CIOMP), lasers and laser guide star system (TIPC & IOE), Wide-Field Optical Spectrograph (WFOS) and Infrared Imaging Spectrograph (IRIS) (NIAOT, USTC, NAOC, SIOM, and CIOMP etc. ), and instrument cooling systems (TIPC). 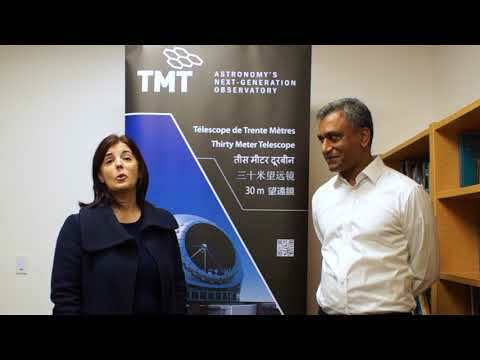 The conference also introduced the TMT Early-Career Initiative program. In 2018, the Hawaiian Supreme Court ruled in favor of TMT with a valid CDUP (Conservation District Use Permit), namely the permit of construction on Mauna Kea. The positive news will boost the implementation of relevant Work-Package tasks in China. Part of the meeting was dedicated to comprehensive discussions on HROS, a second-generation instrument of TMT. Thirteen astronomers proposed science goals as well as relevant technical requirements, covering a broad astrophysical fields such as: cosmology, quasars, Gamma-ray bursts and gravitational wave counterparts, nearby galaxies, our Galaxy, stars, solar systems, and exoplanetary systems. Sixteen technical experts also introduced their relevant technical backgrounds and capabilities that could benefit the design and construction of HROS. The conference reports and discussions show that Chinese astronomical community has keen interests and demands for HROS, with enthusiasm for its engineering and development. In subsequent video conferences, members of TMT-India, TMT-Japan, and TMT-China reported their science cases, technical requirements as well as their capabilities related to HROS development, and expressed intentions for collaboration. Members of TMT project office in Pasadena also attended the video conference. Participants of the conference came from Peking University, Tsinghua University, University of Science and Technology of China (USTC), Nanjing University, Shanghai Jiao Tong University, Huazhong University of Science and Technology, Sun Yat-sen University, Xiamen University, Tianjin University, Hangzhou Dianzi University, Polar Research Institute of China, and several institutes from Chinese Academy of Sciences including NAOC, Shanghai Astronomical Observatory, Purple Mountain Observatory, Yunnan Observatories, Nanjing Institute of Astronomical Optics & Technology National Astronomical Observatory (NIAOT), Changchun Institute of Optics, Fine Mechanics and Physics (CIOMP), Technical Institute of Physics and Chemistry (TIPC), Institute of Optics and Electronics (IOE) and Shanghai Institute of Optics and Fine Mechanics (SIOM).